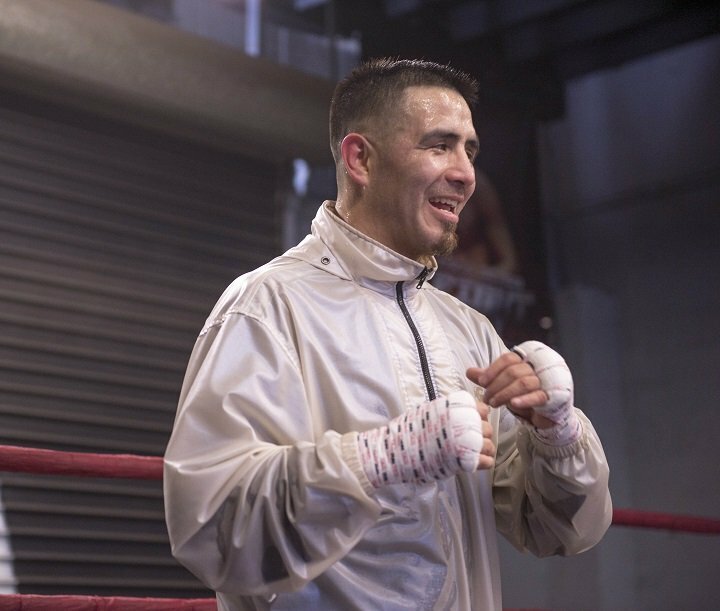 Former world champion Brandon “Bam Bam” Rios hosted a Los Angeles media workout Wednesday in advance of his welterweight title eliminator against Danny “Swift” Garcia Saturday, Feb. 17, live on SHOWTIME from Mandalay Bay Events Center in Las Vegas and presented by Premier Boxing Champions. In the co-feature of the SHOWTIME CHAMPIONSHIP BOXING telecast (10 p.m. ET/7 p.m. PT), undefeated super middleweight world champion David Benavidez and top-rated contender Ronald Gavril square-off in a rematch of their thrilling September 2017 bout in which Benavidez won the vacant title by split decision. In the telecast opener, welterweight contender Yordenis Ugas meets Ray Robinson in an IBF 147-pound title eliminator. “I’m training really hard and I’m ready to get back in the ring. My weight is perfect right now and I’m just ready to give the fans a great show. “This is the kind of fight that I asked for because I know that beating a guy like Danny Garcia will mean a lot to my career and put me on the fast track to accomplish my goals. “Danny has a lot of power on his hook. He throws it hard and is accurate. We’ve worked hard to prepare for this moment and I’m excited. “Having Robert Garcia here makes me much happier in training. I love the instructions from him and Donald Leary, and I love having them as my corner. Sparring the young guys in Robert’s gym really has helped me. Those guys are hungry and always pushing to prove themselves. I have to keep elevating my game. “I’m going to win. That’s my mentality. I’m going into this fight with that same hunger and drive to never be defeated. I’m going to do whatever I have to do to win this fight. “We’re expecting to fight the best version of Danny Garcia. I know he had his first loss and wants his title back, so he’ll be prepared. I think we’re going to give the fans a great show. “I feel rejuvenated and more mature than ever before. I’ve already been to the top. I just want to do things right this time so I can get back up there and stay there. I’m taking this camp very seriously to be at my best on February 17. I’m going to go out there and execute the game plan. “For this fight Brandon has been so motivated and training so hard. He’s very close to weight already and we’ve had more than enough rounds of sparring. “Brandon is like my little brother and he’s definitely part of the family. I’ve always been in touch with him even when I wasn’t training him. When we agreed to team up again, the promise was that he had to stay healthy and train hard and show us that he wants to be champion again. Since that day, he’s been on a mission. He’s doing it the right way. “Danny Garcia is a great two-division world champion. We expect him to be confident and I’m sure he’s training hard to get a good win. Brandon is going to be motivated to give everyone a great fight. His mind set is to go out and beat Danny Garcia and that’s what he’s going to do.